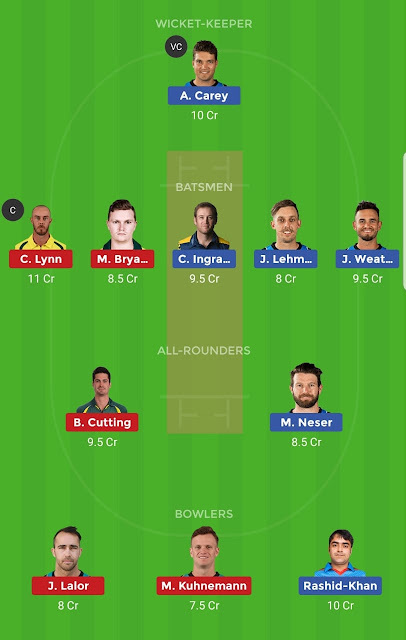 ADS vs BRH, 50th Match, Big Bash League 2018-19. Adelaide Strikers announced 13-player squad for the match. Peter Siddle replaces Billy Stanlake in the squad. ⭐Siddle will come straight in the playing XI replacing Wes Agar or Cameron Valente. Wes Agar is likely to be axed. Brisbane Heat declared 13-men squad for the match with two changes. Mitchell Swepson & Mark Steketee are added to the squad replacing Mujeeb-ur-Rehman & Ben Doggett. Mujeeb has went back to Afghanistan while Brendan Doggett is injured. Colin Ingram (c), Rashid Khan, Jake Lehmann, Michael Neser, Cameron Valente, Jake Weatherald, Jon Wells, Liam O’Connor, Ben Laughlin, Alex Carey, Wes Agar, Harry Nielsen, Peter Siddle. Chris Lynn (c), Max Bryant, Ben Cutting, Josh Lalor, Brendon McCullum, James Peirson (wk), Alex Ross, M Kuhnemann, Jack Prestwidge, Matt Renshaw, Sam Heazlett, M Swepson, Mark Steketee. Alex Carey (wk), Jake Weatherald, Jake Lehmann, Colin Ingram (c), Jon Wells, Harry Nielsen, Michael Neser, Rashid Khan, C Valente/W Agar, Peter Siddle, Ben Laughlin. 🎬Watch Video Team for more details on each & every player, C & VC Options etc, you can make your own combination with the help of video.